As an Aviation Support Officer you'll be in charge of groundcrew and communication specialists, providing the vital services that make our helicopter missions possible. You'll command up to 50 soldiers, making sure they're motivated, trained and competent to carry out their jobs. On exercises and operations you could be responsible for running the airfield at a Main Operating Base, or deploying forward to link up with infantry units to provide re-arming and refuelling capabilities closer to the action. Command and lead a Ground Support Flight of up to 50 soldiers as a Second Lieutenant. 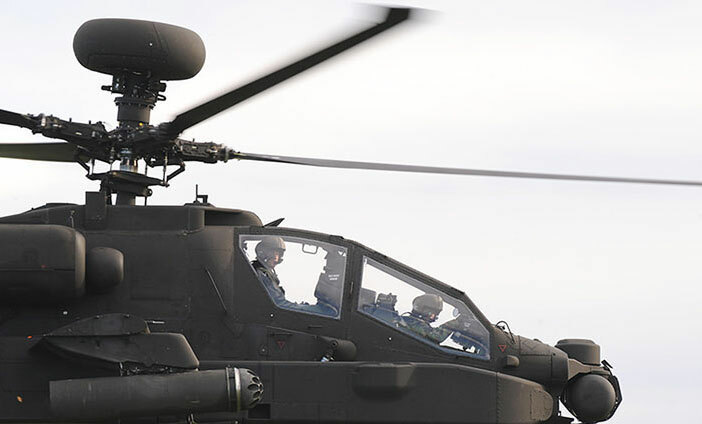 Be responsible for getting the Army’s fleet of battlefield helicopters in the air. Deploy all over the world, wherever your squadron goes. Manage the careers, welfare and development of your large team of soldiers. You begin by qualifying as an Army Officer. That means taking the 44-week Commissioning Course at the Royal Military Academy Sandhurst. Here, you learn leadership skills and how to apply them in a military setting. managing helicopter landing sites, aviation communications, re-arming, re-fuelling and setting up Forward Arming and Refuelling points. When you’re finished, you’ll be capable of managing a Ground Support Flight (your team) and getting a squadron of helicopters airborne anywhere in the world. 35 ALIS points at GCSE (34 for SNQs) from 7 GCSE/SNQ subjects, with a minimum grade C/4 in English Language, Maths and a science or foreign language. Like all Army Reserve Officers you do an in-depth programme of officer training, which ends with a short course at the prestigious Royal Military Academy Sandhurst. “Being an Aviation Support Officer in the Army Air Corps gives you a unique opportunity to work with helicopters as well as commanding soldiers. On exercise, which could be in the UK or abroad, I command a Forward Arming and Refuelling Point to extend the range of the Apache and Wildcat helicopters. When not exercising I ensure the soldiers are correctly qualified and competent. There are loads of other opportunities such as sports tours and Adventure Training. The AAC is a great place to serve and I would recommend it to all."